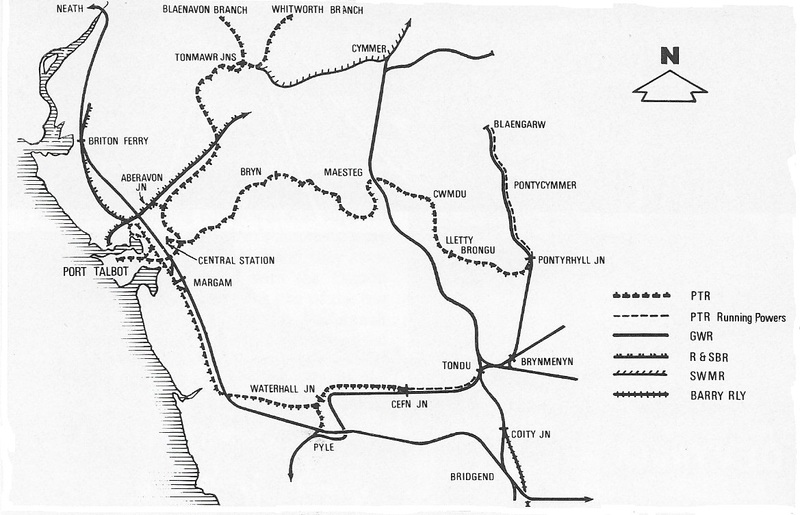 The Port Talbot Railway & Docks Company (PTR&D) was one of the few to be conceived as an integrated undertaking from the outset, and was one of the last standard gauge, mainline railway companies to be incorporated. Its origins go back to 1834 when local industrialists obtained an Act of Parliament to form the Aberavon Harbour Company. This Act was soon realised to be inadequate and in 1836 a further Act was obtained authorising the formation of the Port Talbot Company, named after the local landowner, CRM Talbot, with powers to build an enclosed dock, the first in South Wales. This company evolved in 1894 into the PTR&D, which threw out railways into the Avon, Duffryn, Llynvi and Garw valleys and further developed the dock into a significant coal exporting port, the total route mileage being about 33.5 miles. Part of the company's Ogmore Valleys Extension line still sees occasional use. Formation of the Aberavon Harbour Company with powers to improve the existing harbour. Powers to extend the lock and improve the dock, not completed until 1876. The English Copper Company, which was the major shareholder of the Port Talbot Company, owner of the Cwmavon Works and operator of the dock, failed. All shares passed to CRM Talbot. The death of CRM Talbot. The Port Talbot Company and the Margam and Penrice estates were inherited by his daughter, Miss EC Talbot. Mr JA McConnochie appointed her Consulting Engineer and Mr E Knox her principal Agent, with instructions to determine what could be done with the dock. Port Talbot Railway & Docks Act, "to dissolve and reincorporate and confer further powers upon the Port Talbot Company and to authorise it to construct an additional dock and railways and for other purposes." Running powers over the GWR from Pontyrhyll to Blaengarw were granted. Port Talbot Railways & Docks (Ogmore Valleys Extension) Act, "to enable the Port Talbot Railway & Docks Company to construct new railways and works in the Ogmore Valleys in the County of Glamorgan, to acquire the Morfa Railway and the Cefn & Pyle Railway, and for other proposes." An agreement with the GWR restricted the new railways to a line from Copper Works Junction to Cefn Junction on the Tondu to Pyle branch. The Morfa Railway was not purchased. Port Talbot Railway & Docks (South Wales Mineral Railway Junction) Act, "to enable the Port Talbot Railway & Docks Company to construct new railways in the County of Glamorgan to join the South Wales Mineral Railway and a Railway known as the Whitworth Railway and to acquire the last mentioned Railway and for other purposes"
Whitworth Railway purchased for £9000, becoming the Whitworth branch of the PTR. Cefn & Pyle Railway purchased from Miss Talbot for £14000, becoming the Pyle branch of the PTR. Blaenavon Railway purchased for £7300, becoming the Blaenavon branch of the PTR. Passenger service Port Talbot Central to Pontyrhyll commenced. New lock first used, dock not completed until 1901. Tonygroes Junction to Tonmawr opened. Copper Works Junction to Cefn Junction opened. And Duffryn Junction to docks opened. Passenger service extended to Blaengarw. Running powers between Pontyrhyll and Blaengarw for mineral traffic given up. Such traffic for Port Talbot in future to be conveyed by the GWR via Tondu and thence over the PTR's line from Cefn Junction to Margam. Agreement to work the South Wales Mineral Railway as from 1 January 1908. Three agreements with the GWR: (1) the GWR to work, run over, and use the main lines of the PTR&D, (2) the GWR to hire and maintain the PTR's rolling stock, (3) the GWR to maintain and repair the PTR's railways, stations, etc. The first of these was deemed to have come into effect on 1 January 1907. The PTR&D retained control of the docks and all the dock railways. The GWR acquired running powers over the docks lines, the PTR&D retaining control of the actual docks and related facilities. Port Talbot Railway & Docks Act, "to authorise the Port Talbot Railway & Docks Company to extend the piers at Port Talbot to construct a new entrance lock and for other purposes." Never put into effect, although the GWR did consider reviving the Act in 1930. Saturdays only passenger train service to Tonmawr commenced. Terminated in September 1930. PTR&D absorbed into the GWR. Passenger service on main line cut back to Maesteg. Oakwood to Margam Forge section (SWMJnR) closed. Section of main line from Cwmdu to Pontyrhyll removed. Duffryn Junction to Margam Forge (SWMJnR) closed. Duffryn Yard engine shed closed. Duffryn Junction to Maesteg closed. Duffryn Junction to Copper Works Junction closed. For the Port Talbot Railway. Track Layout Diagrams of the GWR and BR WR. - RA Cooke - Section 49A Tondu branches. Track Layout Diagrams of the GWR and BR WR. - RA Cooke - Section 50A Neath to Port Talbot. Track Layout Diagrams of the GWR and BR WR. - RA Cooke - Section 50B Margam to Bridgend. Track Layout Diagrams of the GWR and BR WR. - RA Cooke - Section 51 Port Talbot & Cymmer branches. Railway Magazine, August 1908. The Port Talbot Railway’s New Type of Rail-Motor Car. Railway Magazine, November 1900. The Port Talbot Railway.